This watch can spice up a normal outfit and add style and attitude into life. It is a great gift for boy friend and friends and family. Exquisite and luxury design brings you a unique charm. Luminous hands and calendar functions. Easy to match well with your dress; could be decoration for your clothes. 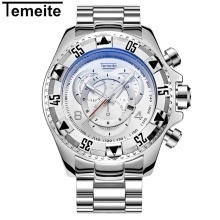 3ATM/30m waterproof watch can resist water spray or drizzle without pressure. Suitable for various occasions like exercise and business meetings. Great gift for your lover, son, families and friends as birthday, Father&apos;s Day, Graduation, Christmas present. 1.Due to the different display screen and light effect, the actual color of the item might be slightly different from the color showed on the pictures. 2.The color of package box will be sent at random. Please understand, thanks.